I thought I'd share my July 1995 newsletter (just text, no images at that time) which was inspired by Steve Jobs' commencement address at Stanford University. A few changes have been made as some of the links are no longer live. "Letters are symbols that turn matter into spirit." July is summer and vacation for many. I am taking a bit of a vacation from the norm in this July newsletter and indulging myself is something book related but not about books. On the Books Arts List (info on how to subscribe below), there was a posting about the commencement address by Steve Jobs, founder of Apple Computer, at Stanford University. It is a moving statement of his experience and philosophy of life and I highly recommend reading it. One of his main points is that you can't understand the way the experiences in your life will connect until later. He refers specifically to his experience taking a calligraphy class at Reed College and its impact on the quality of typography in computers. None of this had even a hope of any practical application in my life. But ten years later, when we were designing the first Macintosh computer, it all came back to me. And we designed it all into the Mac. It was the first computer with beautiful typography. If I had never dropped in on that single course in college, the Mac would have never had multiple typefaces or proportionally spaced fonts. And since Windows just copied the Mac, its likely that no personal computer would have them." This all reminded me that my first entry into the world of visual art was calligraphy. I spent about eight years as a serious practitioner doing both commercial and creative work. For years I was deeply in love with the form of letters. In addition to letters on paper, I put them on my clothes, my kitchen tiles and dishes with the help of a potter friend, and made them in the sand when I went to the beach. For this issue, I've gathered some websites to increase awareness of the form of letters for both adults and children. The point of these is not learning the alphabet, although that can certainly be accomplished as well, but to increase children's sensitivity to the actual form and construction of letters. The Alphabet by Abba Richman has beautiful black and white photos of the 26 letters found mostly in the urban landscape. He has also made one of color photos. For a found alphabet of pastels and watercolors from the urban landscape, check out Stephen T. Johnson's Alphabet City, a Caldecott Honor Book published by Penguin Putnam. The Canadian Bookbinders and Book Artists guild has a couple of informative pages on calligraphy. When you get to the bottom of page on, go to the information on the history of the roman alphabet for a more detailed description of the changes in letterform through the ages. 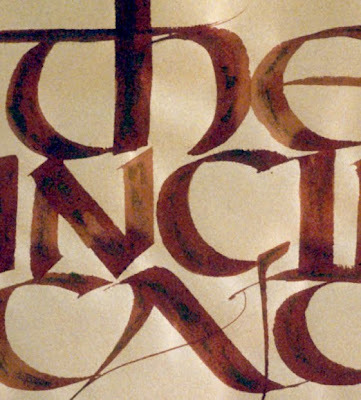 I have a very removed connection to Reed College and calligraphy. One of the most influential calligraphy classes I took was a week-long workshop at a 1982 conference in Philadelphia with Jaki Svaren, author of the wonderful book Written Letters, who had studied with Lloyd Reynolds who was the key person responsible for calligraphy at Reed College. Other students of Lloyd Reynolds at Reed, in addition to Jaki and Steve Jobs, were the Beat poets Gary Snyder, Lew Welch, and Philip Whalen. My mentor, Jenny Hunter Groat, also studied with Lloyd Reynolds, as well as the authors of the series on Italic handwriting for children mentioned above. please excuse the self promotion but it is an abecediary and thus relevant to this thread I hope! Thanks for sharing Mo. It's such a beautiful book.